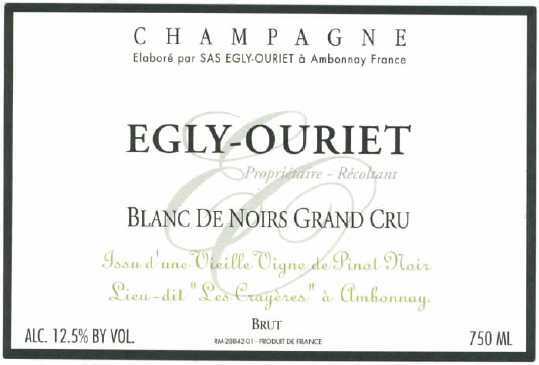 Domaine Egly-Ouriet is known for vinous Champagnes offering concentration and complexity. Winemaker Francis Egly harvests very ripe grapes and ages his wines in barrel for longer than almost any other Champagne house producing Champagne that is age-worthy, complex, and often compelling. Based in Ambonnay, the estate’s grand cru vineyards are located in the villages of Ambonnay, Verzenay and Bouzy; premier cru Pinot Meunier vineyards are located in the village of Vrigny (on the Petite Montagne). Grand cru vineyards are planted to 70 percent Pinot Noir and 30 percent Chardonnay with an an average vine age of 40 year. Working in the vineyards to control yields with the goal of obtaining truly ripe grapes is Egly’s primary philosophy. Grapes are hand harvested and fermented on indigenous yeasts, partially in French oak barrels and partially in tank. Malolactic fermentation is allowed or blocked depending on the needs of the vintage. Wines spend an especially prolonged time on fine lees, with three to four years the minimum. Dosage before bottling is very low, seldom more than 2 grams-per-liter. A single-site, multi-vintage 100% Grand Cru Pinot Noir cuvee from 70 year old vines fermented and aged in a mix of Burgundy barrels and stainless steel tanks. Aged 5 years on the yeasts and does to less than 2 grams per liter. The hallmark of this wine is its richness and depth with layers of tflavor coming from terroir, technique and ripe fruit. Red fruit with some ripe citrus accented with an earthy-chalky moinerality and lots of yeasty lees notes. Lovely rich compelling Chamagne. As much wine as sparkling wine. Almost Champagne as an intellectual exercise. BearScore: 96+. A Grand Cru (Ambonnay, Verzeneay, and Bouzy) blend of 70% Pinot Noir with 30% Chardonnay (40 year average vine age) blended with some of Egly Ouriet’s excellent still red Ambonnay Rouge for color. Fermented and aged in a mix of Burgundy barrels and stainless steel tanks. Aged 3 years on the yeasts and does to less than 2 grams per liter. Quite vinous with some red wine character to go with its Champagne focus and minerality. Layrs of technique and terroir ad to the richness of the fruit. Hints at exotic and spice. Great food Champagne. BearScore: 94+.